His is a name forever etched near that of the Prophet of God, hallmarking the noble words, deeds, and tacit approvals or disapprovals that are embodied in the rich corpus of hadith. He is undoubtedly the primary custodian of the Prophetic legacy, and there is hardly a speech delivered anywhere in the Muslim world, even in its remotest corners, that does not mention his esteemed name. Muhammad b. Ismail, more popularly known as Imam Bukhari, was a veritable genius with an aptitude for memorizing massive amounts of information. This exceptional ability led him to memorize the entire Quran by the tender age of nine, and then thousands of traditions of the Prophet. His father passed away when Bukhari was an infant and, being a man of learning, left behind a vast library which absorbed much of the young orphan’s time and interest. Bukhari quickly eclipsed the scholarship of his region, correcting his teachers on many an occasion and authoring his first written works in his late teens. He then travelled widely through all the centers of learning in the Muslim world collecting knowledge and hadith from over 1,000 teachers. The fact that he had become blind (his sight was miraculously restored in his later years) did not deter him from his scholarly pursuits. After hearing his teacher, Ishaq b. Rahawayh, remark in one of his lessons, “I wish one of you would dedicate [yourself to] a compilation devoted to authentic hadith.” Bukhari was intrigued and committed himself to the endeavor. When he later saw himself in a dream fending off flies from the person of the Holy Prophet, he took it as a sign and redoubled his efforts. 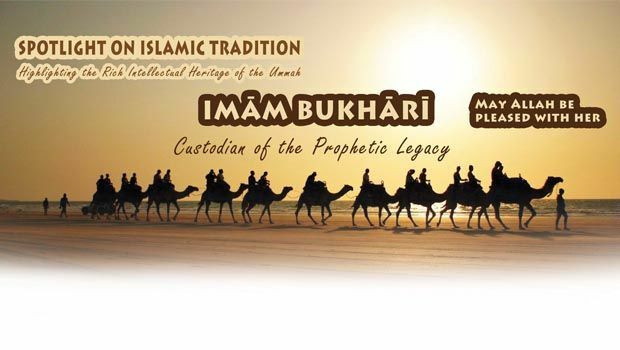 All in all, Imam Bukhari spent almost two decades travelling the world to research and gather hadith, which served as the foundation for a definitive compilation that would ultimately achieve canonical status in the Muslim world. Imam Bukhari’s Sahih, the popular name extracted from an expansive title, was completed in the year 232H, when he was 38 years of age. It was a colossal effort whose worth and impact was immediately felt. The author presented the finished product to three of his teachers who were great masters of hadith in their own right: Yahya b. Main, Ali b. al-Madini, and the renowned Imam Ahmad b. Hanbal. Needless to say, he received their unanimous approval. Imam Bukhari spent the next 24 years of his life teaching this book to a large body of students whose numbers are indicated in various sources as between 1,000 and 90,000. The last of his students was Muhammad al-Farabri, and it is upon his transmission of the Sahih that almost all the modern printings are based. Imam Bukhari divided his book into 97 chapters that he referred to as kitabs, and 408 subchapters called babs. The total number of hadith in his compilation equals 7,397—according to the dominant view—many of which are repetitions, sometimes with alternate chains of transmission. The total number of hadith without repetition is 2,762. These were selected from more than 600,000 narrations that he had managed to compile and memorize! Imam Bukhari’s effort was innovative in many respects. First, choosing to depart from a characteristic of his forerunners, he gathered exclusively the hadith of the Prophet, excluding all additional material such as the statements and opinions of the Companions and early authorities. Second, he introduced more stringent standards for accepting narrations than any of his predecessors had adopted, effectively reducing the size, and arguably the scope, of his work to only the most rigorously authentic material from the Prophet. Naturally, this generated some controversy, as he was accused of excluding much material that was worthy of consideration. Bukhari was undeterred, confident in his mission of safeguarding and authenticating the Prophet’s legacy from all spurious or even suspect material. In fact, he never claimed to have compiled the entirety of the Prophetic traditions, but rather his collection was meant to be an authentic selection from a greater body of material, as indicated by the term mukhtasar in the full title of the Sah?h. Third, the collection was utterly comprehensive, covering a broad array of legal topics, aspects of belief, history, inspirational material, and commentary on the Quran. Previously, the first historical stage of hadith works (known as the musannaf collections) were topically arranged works that combined all types of source material, while the second stage had consisted of the musnad works, focusing on producing storehouses of Prophetic narrations with supporting chains of narration irrespective of their authenticity. Bukhari and his students, such as Imam Muslim, on the other hand, spearheaded the Sahih (authenticity) movement which sought to combine the previous two stages and purge them of inauthentic elements. Thus, they began to compile authentic Prophetic hadith works that were arranged by subjects. In the end, Bukhari compiled not just a hadith collection but a wide-ranging manual that captures his penetrating insight and understanding of Islamic law, theology, and history. In the final analysis, the greatest honor for an author is to be remembered and read by others. For modern authors, bestseller lists and awards for literature serve as benchmarks of success. But to be read by millions of people for over a thousand years, a number continually increasing, is a literary success unparalleled in the annals of human history.